I have two key ISD Processes – that produce Content – Instructional and Informational – for in-the-moment-of-need and/or prior to that moment of need. Both are intended to enable Performance Competence in an Enterprise Learning Context – as opposed to an Educational Learning Context or a Personal Learning Context – with the first Context needing/having more Formal Learning than the second or third Contexts. But every case is different. The two ISD Processes are CAD and MCD. 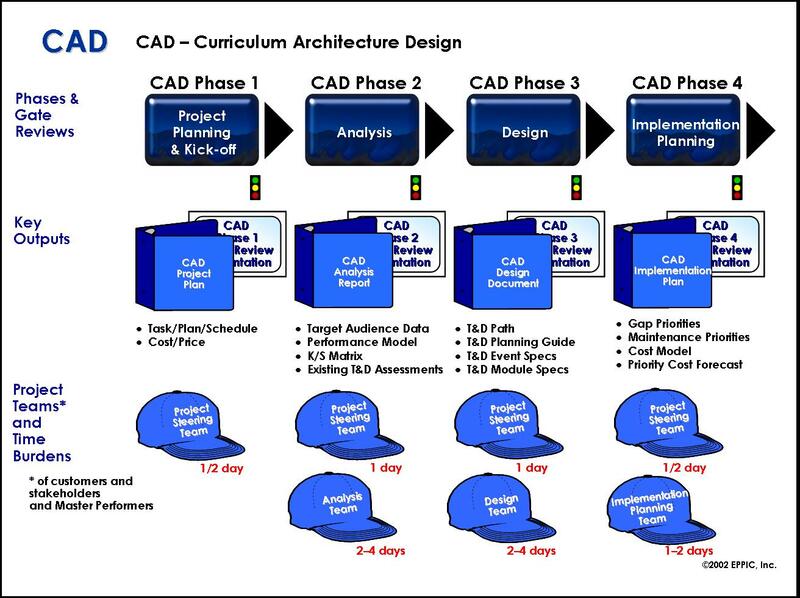 CAD- Curriculum Architecture Design – that produces a Development Plan/Path and rationalizes all existing T&D/L&D (or not) for a specific Target Audience of Performers/Learners – and doesn’t produce any new content – but identifies the gaps in the current offerings as well as identifies content for reuse “as is” (AI) or “after modification” (AM) and most importantly in some cases – existing content that is “not applicable” (NA). 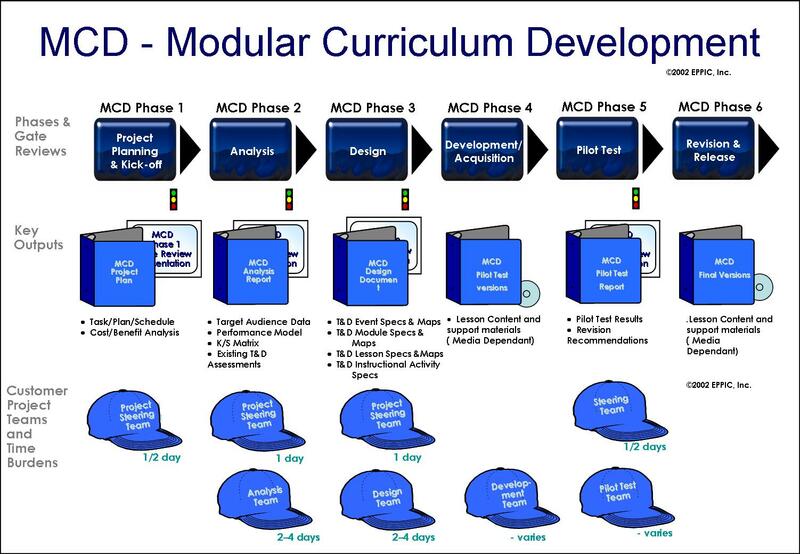 Note that the ISD methodology-set of IAD – Instructional Activity Development is a sub-set of MCD. The project manager role is critical, as mentioned earlier in the chapter. See the chapters on project management in the sections on Curriculum Architecture Design and Modular Curriculum Development. The analyst role is central to generating good data from the Analysis Team. The ISD professional in this role leads and facilitates the structured, analytic methods in the Analysis Team meeting and conducts some of the analyses outside the Analysis Team meeting. The data gathered by the analyst is used to generate an Analysis Report. The selection, training, and assessment of the individuals for this role is of supreme concern to the project manager. Group facilitation skills are critical! In some cases, the project manager may be the analyst. The CAD designer role is to design in full view and out loud in the presence of the Design Team. The designer can expect live, ongoing critiques of his or her work. The designer can also expect to have to provide rationale to the Design Team for design concepts, models, and elements. The designer should anticipate this feedback and perhaps, pushback, because this is built into the PACT Processes on purpose! It’s desirable to test the feasibility and practicality of design concepts, models, and methods as soon as possible. It is better to fix things right away than to continue with a faulty design that only guarantees later rework. 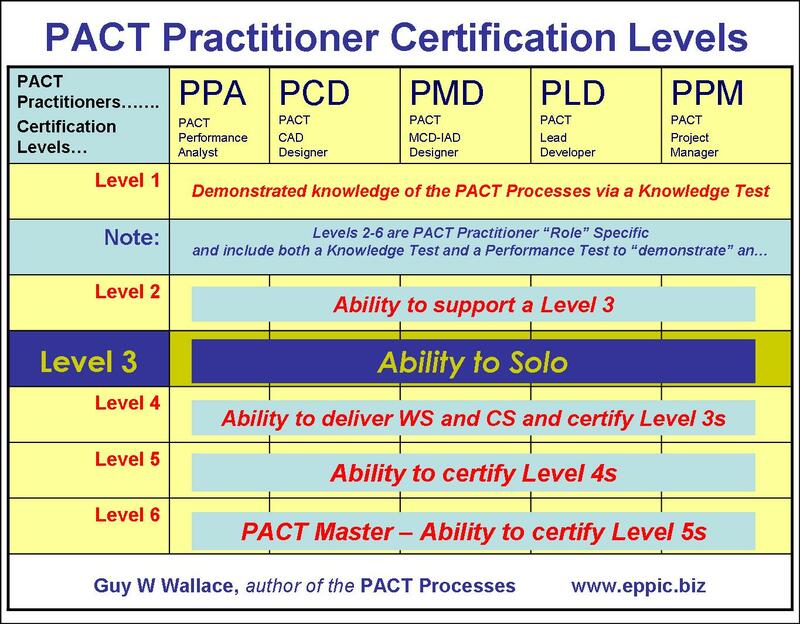 When selecting PACT designers, the project manager considers those who will not let their egos get in the way of this design methodology. Also, if inarticulate, they will struggle. If they are weak at group facilitation, they will struggle. If they can’t write legibly on the flip chart easels/paper used extensively in the PACT Processes, they will struggle. It is important to write things down and post them in PACT for continual reference in all of the downstream analysis (and design) processes. 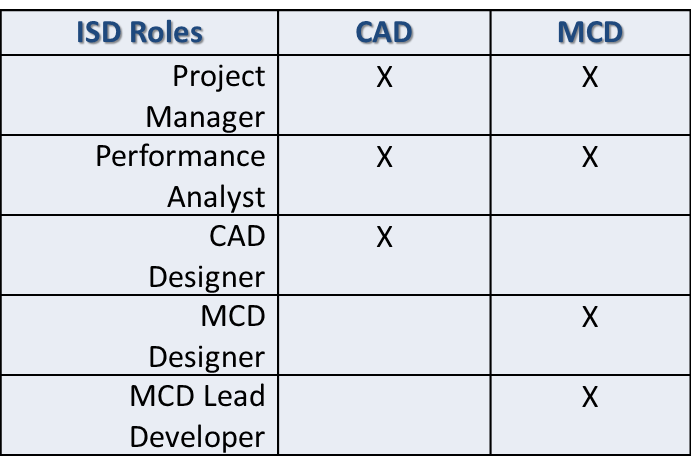 The MCD Designer role is similar to the CAD designer role, except that it is in this capacity that the ISD practitioner practices what is closest to the traditional ISD design job―designing T&D/L&D! Again, facilitation skills, communication capabilities, and lack of ego are key issues for the selection of designers for this role. Often, the same individual may fill the analyst and designer roles. However, a good analyst may make a lousy designer and vice versa. The skill sets overlap, but there are some key differences. The MCD Lead Developer role within PACT is fairly traditional – when this is approached as a team effort. The biggest difference is that the Lead Developer and the entire Development Team that they lead has a very detailed set of design specs and maps to follow when they build the materials. They can’t waver from the design arbitrarily, because the entire content configuration may be sub-optimized. They can spend their creative energies not on segmenting content and arranging flow, but on sound instructional design for the lessons assigned to them―lessons that include informational segments, demonstration segments, and application segments. 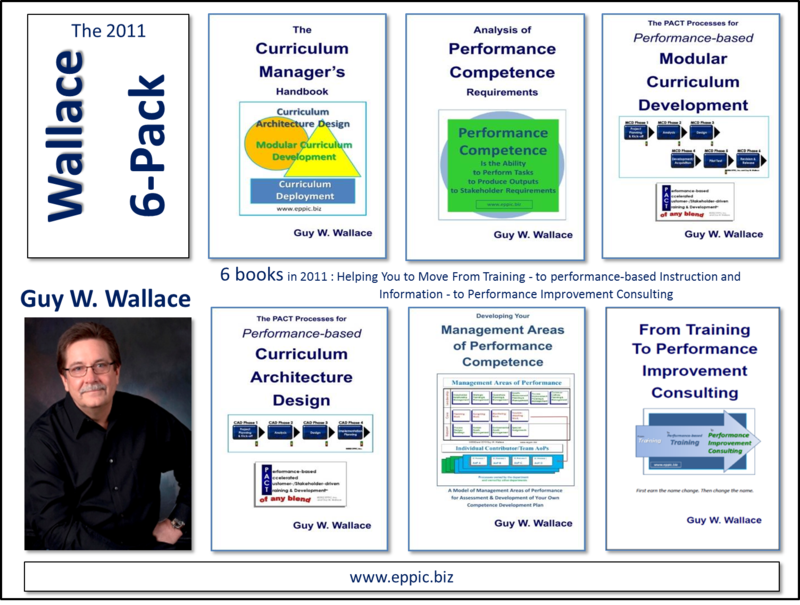 These Roles are covered in these new books that are an update and a reconfiguration of my 1999 book: lean-ISD, plus another couple of books, and many quarterly columns that have been written and published since the late 1990s. For more info on these books please go here – and for more about my Staff Development services please go here.